A dedication ceremony is exactly what it sounds like it would be – you are dedicating yourself to your practice and telling yourself and the Divine that this is the path you wish to pursue. A dedication ceremony means that you are ready to devote yourself fully to your practice whatever that means to you. 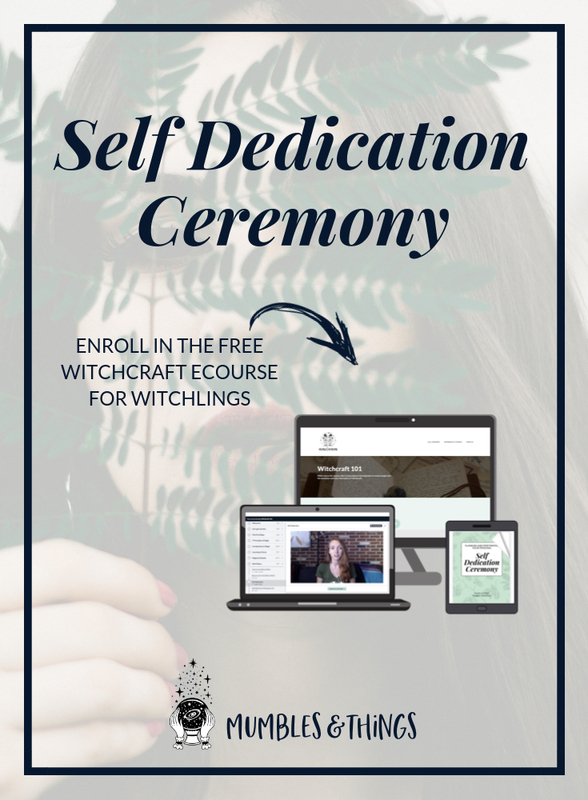 If everything still feels right, and if you still feel like Witchcraft is the path for you after all this studying, now is the time to perform a self-dedication ritual. For some, the dedication ceremony is an important step toward connecting with witchcraft and the spiritual journey. It can be formal or casual, but treat it as a commitment that you are making. I would suggest not doing it at random or without significant thought beforehand. If you’ve been practicing for a while, this can be a re-dedication. I actually do some form of re-dedication every year around Samhain a way to reset and remind myself of why I’m a witch and the power that I hold. I have designing my own ritual workbook. As with everything involved with witchcraft, what works for me may not apply to you or feel right to you. For me the dedication ceremony was an important part of helping me feel connected to my magic. I believe very much in symbolism and as such, holding a dedication ceremony really made me feel like I was a witch by the end of it. Even though as a solitary witch, I was the only person in the room and I was the only one who knew it was happening, I feel like that made it more meaningful because I was doing it for me. So, this is a preview of what is included in the workbook. You can purchase your own workbook by clicking the button below. Choose between a physical book or a downloadable copy you can print at home. There are thirteen themes for your dedication, I call them celebrations. For witches thirteen is the perfect number. It is important to the sacred geometry of this Universe. It reflects a pattern that exists in humans, nature, and the heavens: there are thirteen major joints in your body, there are 13 lunar cycles in a solar year, and the moon travels thirteen degrees across the sky every day. The number thirteen represents good luck and moving with the flow of divine energy. Going with the flow is an important part of a witch's perspective. Fighting against the tide is akin to fighting against change and making bad situations even worse than they already are. Going with the flow of change, on the other hand, brings peace and harmony. Each celebration has an assigned a material and a corresponding characteristic or theme. The themes here are ideas for how you can frame your dedication process. Through research, questions and my own experience I assigned a material and a corresponding characteristic or theme to each celebration. These characteristics are traits I value in others and myself. The first four celebrations honor the four elements of ancient magic and philosophy: fire, earth, air, and water. The following celebrations are extensions of these basic elements and other influential elements in your environment. The final celebration honors the fifth element of spirit. Throughout this book you will find positive affirmations based on the theme of the celebration, journal writing prompts, and activities to help you reflect on yourself, honor the theme and to prepare you for the celebration. For each celebration, you will have a chance to design a symbol or sigil to represent the theme. Only you will know what this symbol means, which will give it that much more power. Later on you can use these powerful symbols to super charge your magic. Embroidery one into spell bags, include one next to your signature, carve one into the top of a cookie before baking, create divination tools, and more! 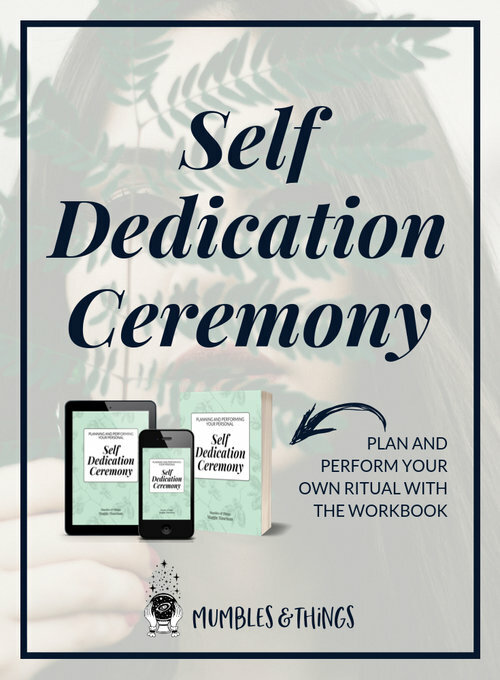 The workbook is full of everything you need for your very own solitary witch self-dedication ceremony. I recommend starting your dedication ceremony at the New Moon and completing the final ritual at the Full Moon of the cycle. During this time focus on each of the themes for the thirteen ceremonies through journaling, releasing and rituals. Of course life happens and it’s perfectly acceptable to complete the ceremonies in the time you have available to you. Maybe you only have weekends, or you want to spend a week or even a month learning about each of these themes and yourself. Have fun working with them and learning how to use them in your practice! This ritual should be yours and yours alone. You may wish to copy the dedication ritual I provide in its entirety, or perhaps you want to change some or all of it. Maybe you only want to spend a day researching, learning, and honoring each theme or maybe you want to spend a month. Do what feels right to you. Design it however you want to, and in a way that will be most meaningful to you. If you believe in symbolism, holding a dedication ceremony can have an incredible effect over you. You may wish to do a formal preparation with a ritual bath prior to your ceremony. Perhaps you'd like to include altar tools that you've crafted yourself - you certainly don't have to, but if you do, it can make the ritual even more personal and unique. You might want to choose a new magical name for yourself, so that you can introduce yourself to your gods with it, as part of this dedication. Some people choose to wait until they have studied for a year and a day before having a formal self-dedication rite. Some do it much sooner. It’s entirely up to you. Finally, if you're good at memorization, you might want to take some time in advance to memorize as much of your ritual as possible - if you're worried you might forget what to say, take the time to copy it ritual by hand into your Book of Shadows, so you can have it with you. 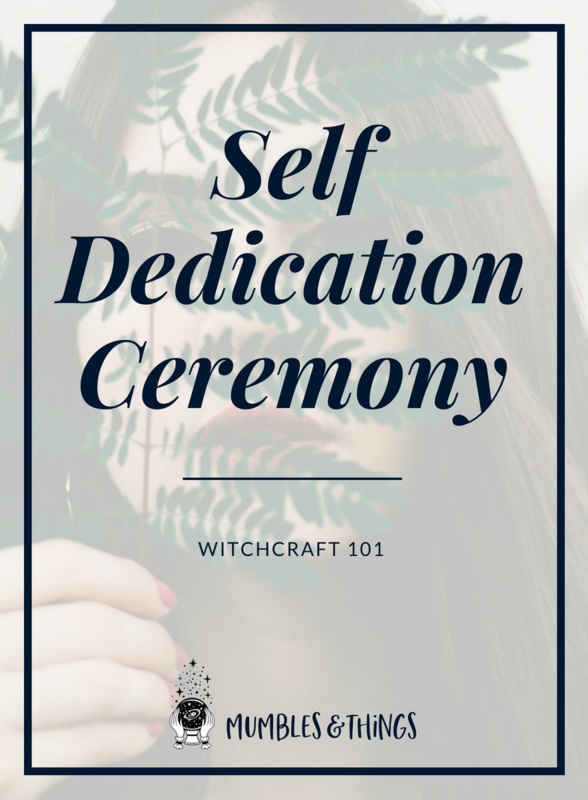 Have you done a self-dedication ceremony? Tell us about it in a comment below.